back to the garden... flower power comes full circle: Giant Crowd greets Garden Guests in Olywood fest screening. Giant Crowd greets Garden Guests in Olywood fest screening. Olympia Crew: (l-r) Kevin, Judy, Tomas, Harvey, Ginny and OnePine. 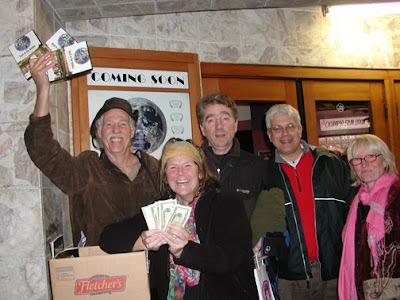 Busking our DVD's...at the Capitol Theater following "Back to the Garden's" screening at the 26th Annual Olympia Film Festival November 8th. Olympia Film Festival (November 6-14th) celebrated its 26th Anniversary this year in the historic grand old Capitol Theater... our film was not only a great fit here but also created a lot of local buzz. Our 3:30 Screening was delayed due to the long line of people still waiting in the ticket line. An excited crowd of 400 waited patiently inside while Harvey Swanson and Tomas Caton performed on Guitar and Mandolin many of Harvey's songs from the BTTG soundtrack. We were padding time to get everyone to their seats before rolling the film. 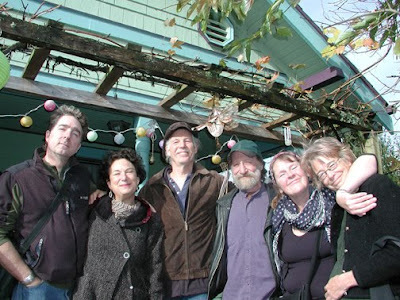 We had the best time with all the old Okanogan friends who came over to gather and play music the night before at Ginny's...So good to have spent time getting to know Ginny, Tibor, Tikva, Avi and girlfriend, Tosi, Eden, Tomas and Brenda...and so many more! Thanks so much for coming out to support our film Olympia! Many thanks to Shade Rupe, the OFF film programmer extrordinare and to Phil Rollins of Olympia's hipster haven, The Archibald Sisters, for putting up our poster in their display window and being the official sponsor of our film!